Yesterday was Day 31 of the legislative session. It was the first legislative day since last Wednesday, which was Crossover Day, or Day 30 of our 40-day legislative session. Crossover day is important because most general bills (not including local legislation) must be passed in one chamber by Day 30 in order to cross over to the other chamber. Ultimately, of course, a bill must be passed by both the House and the Senate, and then signed by the Governor, to become law. In the House we worked until about 9:30 at night on Crossover Day, and considered 41 bills. For a recap of the day's events, click HERE. The Appropriations Act for calendar year 2012 (HB 78) passed. Based on Governor Deal's revenue estimate of $18.25 billion, the budget is $1.7 billion leaner than the budget for the current year, due in part to the loss of a billion dollars in federal stimulus monies. I voted against this budget because it means less for education. I think Georgia continues to go in the wrong direction on education and we need to get serious about creating a world class education system that will train our children to have the skills necessary to compete in the competitive global economy. Simply stated, I believe that education is the foundation for our economic security. The House voted 108-63 to create compacts with other states on health care instead of following the guidelines of the federal Patient Affordable Care Act ("the Act"). I voted and spoke against this bill because it is unnecessary, will never be approved by Congress, and will not have any impact whatsoever on health care. In addition, this bill requires Georgia's taxpayers to pay the check while they get nothing in return. The House did not vote on HB 476, a bill that would have set up health exchanges as required by the Act. I would have voted in favor of establishing the exchanges because they are required by the Act and will improve the choices available for those seeking health insurance. 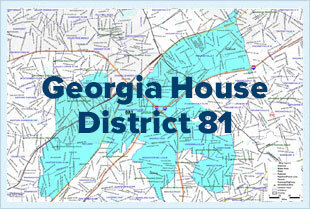 The 82nd District is home to a number of cyclists, and I heard from many of you on HB 180, the 3 foot safe passing bill. As a member of the Public Safety and Homeland Security Committee, I spoke in support of this bill when it came before the committee. I was very disappointed that this bill did not come up for a vote on Crossover Day, and I will take up this issue during the next legislative session. I heard from a number of people on HB 277, a bill that would allow hunters to bait deer with corn and other food. Most of the people who contacted me were not from Georgia, and they favored the bill. I heard from a few constituents who actually live in the 82nd district, and they opposed the bill because it would detrimentally impact the sport. I agreed with those in the district and voted against it, but the bill passed 122-48. SB 10: The Senate approved the local option for Sunday alcohol sales, following three hours of passionate debate on the Senate floor and half a decade of back-and-forth in the public forum. The bill is likely to pass in the House and Governor Deal has said he will not veto such a bill. I will vote for this bill. SB 184: The Senate voted to prohibit teachers' seniority from determining whether or not they get laid off. If the bill passes, the current 'Last In, First Out' (LIFO) policy for laying off educators in the event of a reduction in force would become obsolete. The purpose of this legislation is to retain the strongest teachers, which no one would oppose in theory. However, I want to ensure that any new process will be fair and I want to know what measures will be used to evaluate teacher performance under this new standard. SB 102: The Senate approved a controversial gun bill, which would allow gun owners to carry their guns in churches that agree to allow them, and would also allow owners with permits to carry a concealed weapon in authorized county and/or municipal government buildings. I have concerns about this legislation, but my sense is that if it comes to the House for a vote, it will pass. The first has been taxes and fees on goods and services. You've written to me with your concerns about the proposal to tax veterinary services and other services, products sold by charitable organizations such as the Girl Scouts and Boy Scouts, and membership fees and towing services provided by AAA, as well as food you buy in the grocery store. Those of you who have written to me about these consumer taxes have been unanimously opposed, and you know from my responses that I am opposed to these fees and taxes as well. I will do my best to make our collective voice heard in the House on these issues. A second issue that has stood out in my inbox these past couple of weeks has been the size of the DeKalb County Board of Education. You may know that the House and Senate both have bills that would involve reducing the Board from its present 9 members to either 7 or 5, with more of you suggesting that 5 is optimal. Research findings on effective school boards support what you are asking for. I am a co-sponsor of House Bill 22. and there is widespread support for this among DeKalb County's legislators as well. I will do my best to make this happen. Emails on several bills involving safety for bicyclists also flooded my inbox. I supported all these bills, and will always support ways to make bicycling safe. I began Crossover Day at Livsey Elementary at 7:30 AM. Ann and I greeted children as they walked to school, some in large groups. It was wonderful to see so many happy kids and parents. Congrats to NCA, Simon Northlake Mall, and Electronic Recycling Services, Inc. for a very successful day of electronics recycling. I was proud to support this worthy event.